Get a free consultation today for kitchen design in NJ & NYC! Kitchen design isn’t just about visual aesthetics and color choices: storage space is also a major functional concern. Especially for small kitchen design in urban apartments, storage space is at a premium. From custom kitchen cabinet installation in unusual shapes and sizes, to open shelving and creative displays of kitchen necessities, these kitchen design ideas provide innovative new ways to maximize storage space for all the things your modern kitchen needs. At All 1 Kitchen, we specialize in kitchen cabinet installation and kitchen design in New Jersey and NYC, including small kitchen design for urban apartments where square footage is at a premium. For a free consultation and cost estimate from our experienced contractors and kitchen designers, call us any time at 201-731-5146. These creative, appealing kitchen designs incorporate unexpected solutions to maximize the amount of storage space available, avoiding clutter and creating sleek design aesthetics where everything is in its place. 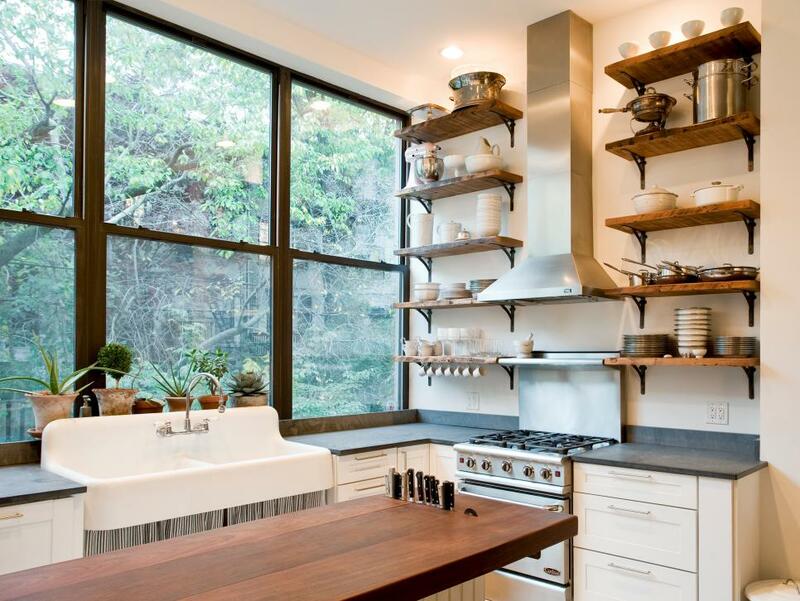 In this airy contemporary kitchen, open shelving above the stove takes the place of upper cabinets. 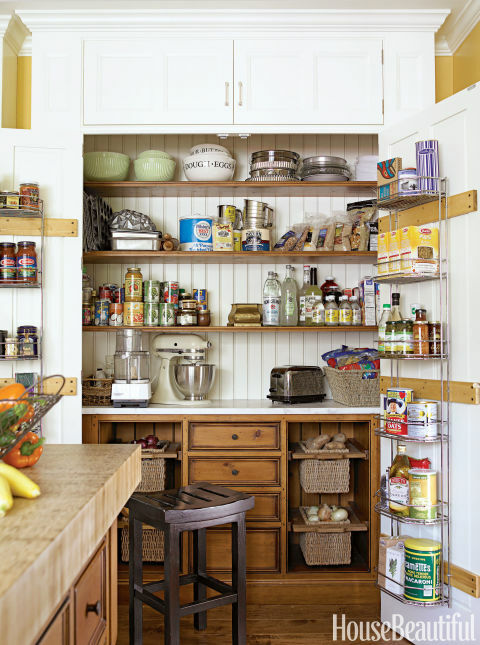 Unlike cabinets, which would clutter the wall and take up too much depth, the shelves keep the small space open. 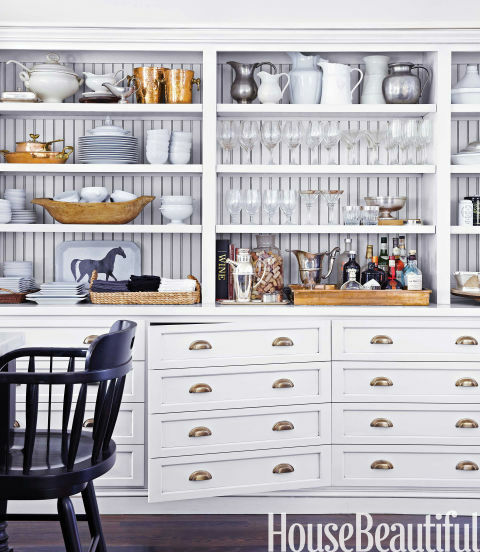 Instead of concealing plates and cookware behind cabinet doors, they’re artfully arranged as appealing display pieces. 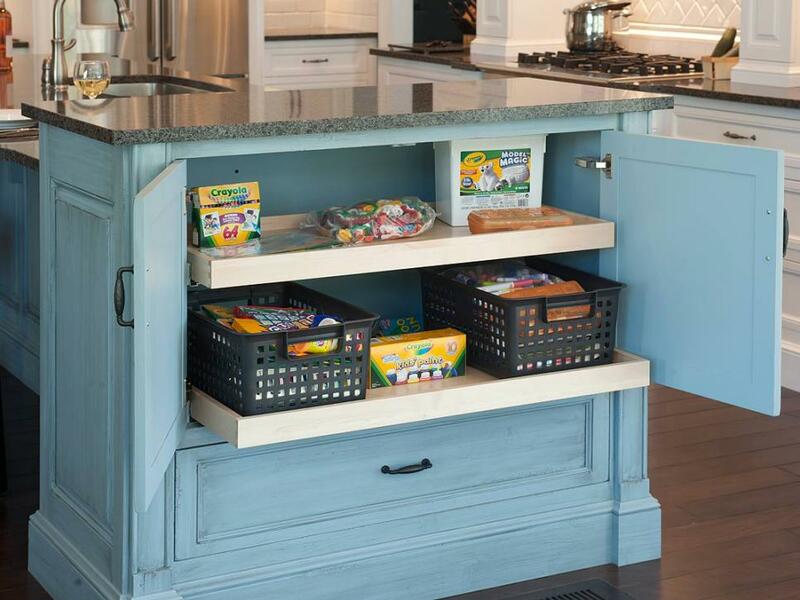 This kitchen island’s hideaway storage is a perfect place to stash arts and crafts supplies for the homeowners’ young children, providing a great way to keep them occupied until dinner’s ready. 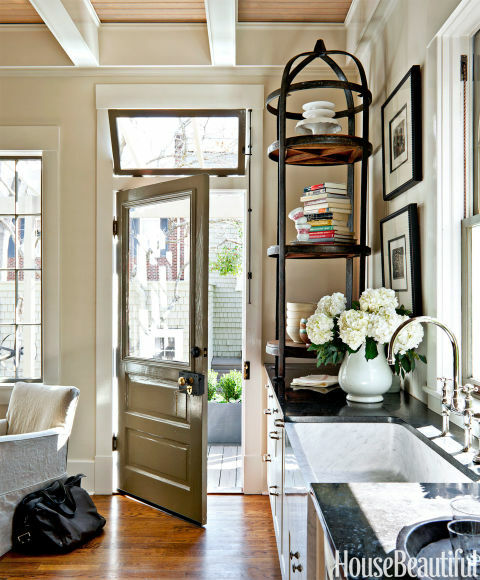 In this small but charming kitchen, a traditional shelving unit or upper cabinets would take up too much visual and physical space. This antique étagère provides an elegant solution, creating an interesting and compact display for books and decorative items. This creative cabinetry was inspired by an antique printer’s desk. It may look like nothing but drawers, but there’s more storage than meets the eye– it’s actually a clever facade for a full cabinet door. Above the cabinets, open shelving merges storage space with decorative display for pitchers, plates, and glassware. In a New York City kitchen with only 48 square feet to work with, this homeowner got creative. 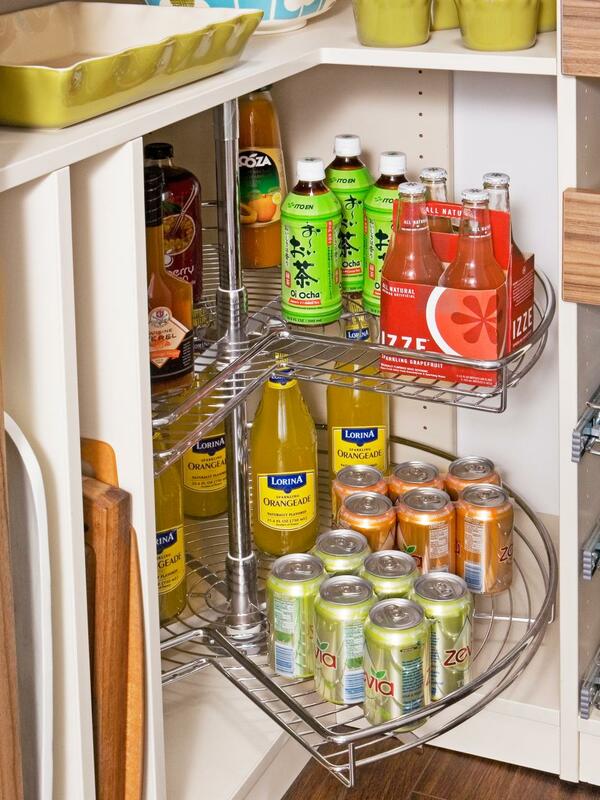 This pullout pantry stores dry goods, sliding out over the countertop when needed. 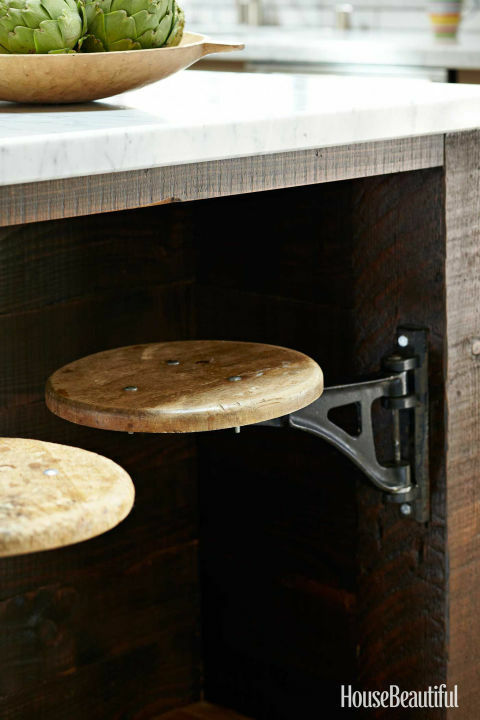 These swivel stools can be pulled out when needed, then tucked away beneath the counter, saving floor space that would be cluttered by conventional barstools. Custom kitchen cabinet installation lets you get creative with shapes and sizing. These corner drawers turn what would have been wasted space into useful fold-out storage. Clutter is sometimes hard to avoid. This kitchen design solves this problem by hiding cooking supplies, small appliances, and other various bric-a-brac in a shallow space with two doors. Drawers and a small countertop provide further storage. 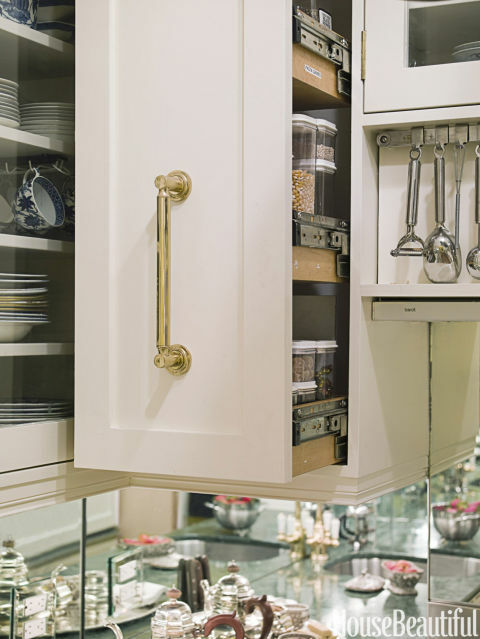 Limited storage space inside your cabinets? This convenient storage rack swivels out when the cabinet is opened, providing easy access to the items inside. Dishes in a drawer? 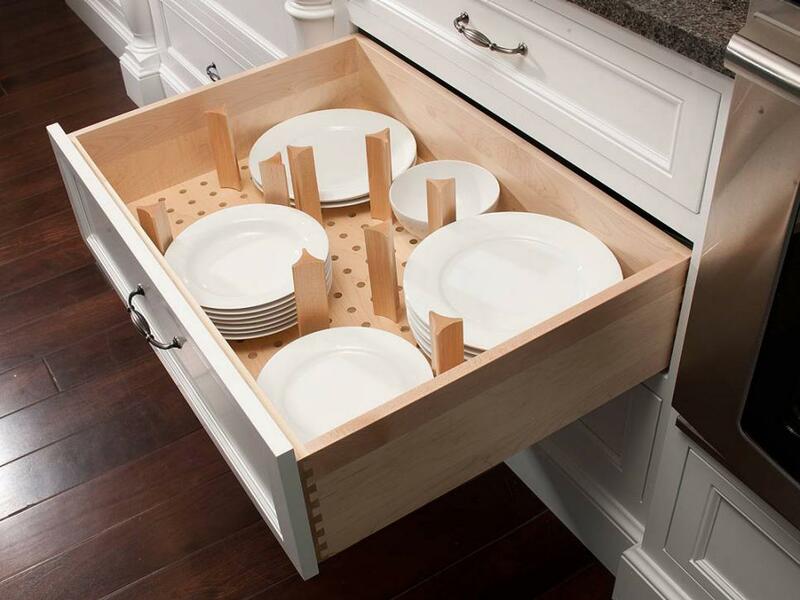 It might sound like a disaster, but these nifty dividers hold stacks of dishes in place, turning a drawer into a suitable place for storing them. Hideaway storage keeps this kitchen neat, clean, and clutter-free. 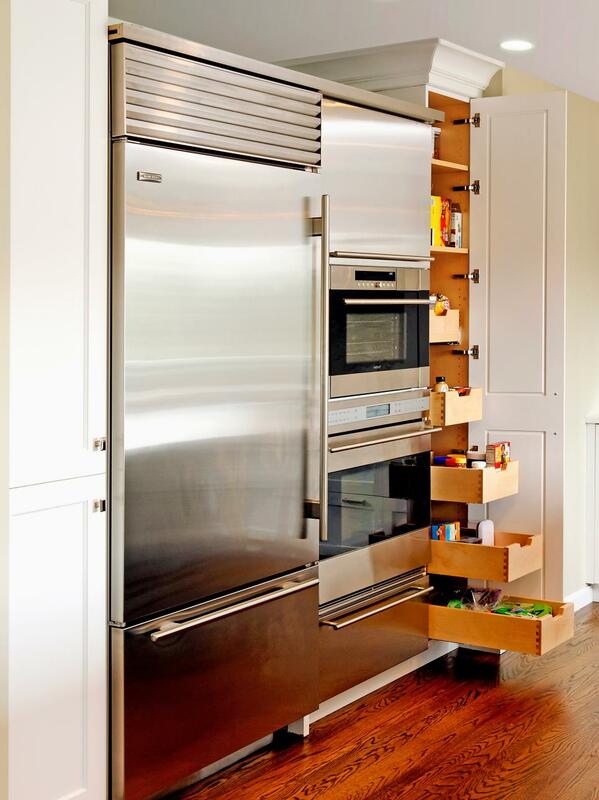 An extra-tall custom cabinet door conceals shelves and drawers for convenient but concealed storage. 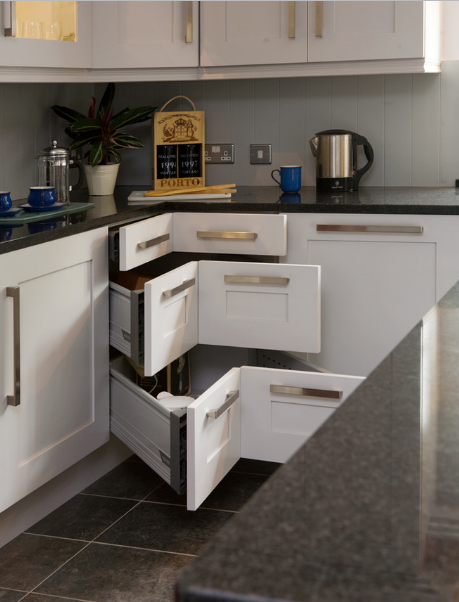 At All 1 Kitchen, our kitchen design experts can help you maximize storage space in even the smallest kitchen. Say goodbye to clutter and hello to a clean, neat, organized workspace with custom kitchen cabinet installation, overhead shelving, extending cabinet shelves, and other creative solutions for your storage needs. We’re always available to talk to you about your unique design vision for your new kitchen. For a free consultation and cost estimate, call us any time at 201-731-5146.